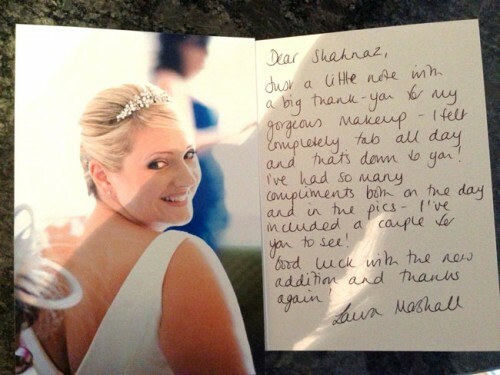 A lovely thank you note from a recent bride at Hanbury Manor Hertfordshire. By booking your wedding before the end of January 2013 you will save 10% off the total cost which is a great saving if you have a large party booking, with a few bridesmaids and mums for hair and makeup! *Please note that on this promotion additional group discounts are not applicable and extra travel may still be charge for locations outside of the 12 mile radius. Wishing all our 2017 Brides a happy New Year! 2016 Hair & Make-up Dates Booking Fast! © Copyright The Makeup Girl 2019.